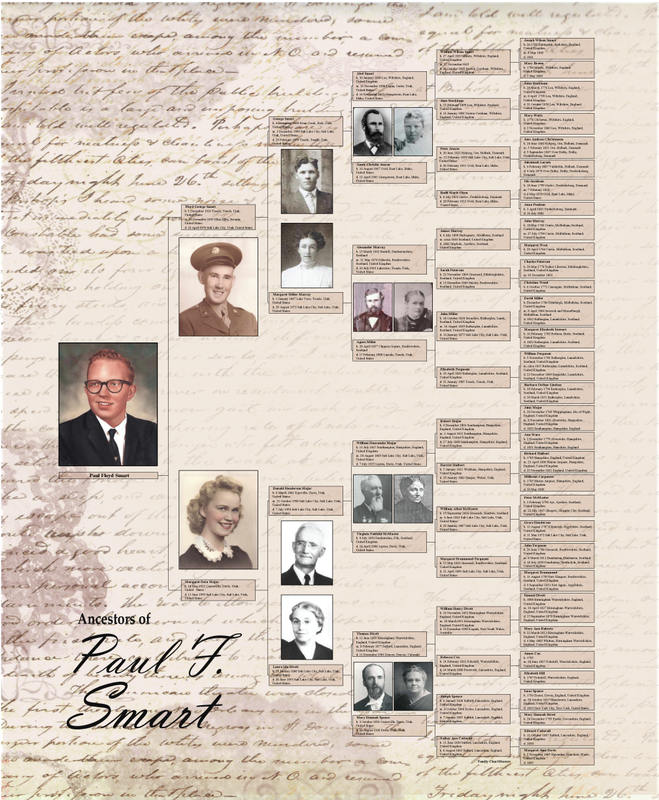 The Family ChartMasters' Chart of the Month features a good friend from Family Search, Paul Smart, with 5 generations of his ancestors. His wife surprised him with this gift and he was thrilled. Printed on canvas, she had it mounted in a gorgeous frame. 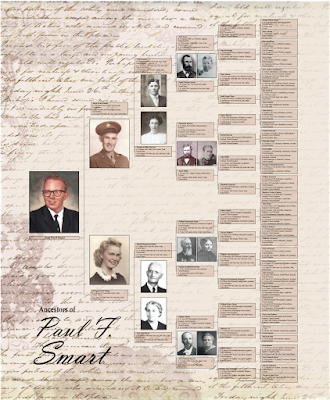 This particular custom decorative genealogy chart design makes a meaningful gift for Mother's Day or Father's Day to highlight a loved one in your family. Artist's grade Canvas Giclee(Fine art reproduction) would be $194.95. Our pricing includes working back and forth with you to get the chart exactly the way you want it. We will include a title, border and/or background if you would like. This pricing includes, up to 10 pictures. Any pictures above 10 are an additional $2.00 per picture. Any extra copies of the exact chart are 1/2 price. Generally it takes about 2-4 weeks to complete a custom chart from start to finish. Once we have your genealogy data file, it takes 3-5 days for us to access it and create a preview for you. Then once we send you a preview, it just depends on how quickly we work back and forth to get a desired final product. Once payment is made, it takes 24-48 hours to get your chart ready, printed, and packaged for shipping. We ship USPS Priority Mail and Shipping for 1-3 charts in the USA is an additional $16.95. Order your custom genealogy chart now for May and June gift delivery. Visit familychartmasters.com to place your order today!